← What’s this blog about anyway? Take two. Beach of stones. Stones as far as the eye can see. Last week Suzi of Laundry Line Divine suggested we play. She suggested we play Food Labels. And thus we did at 12:30 last Wednesday afternoon. We got wild and creative with stuff in our pantry. It was a challenge to make something as ordinary as food labels into something interesting. But I think we both succeeded. Then she suggested the next challenge for this week: Rocks. Shall we photograph rocks in a creative way? 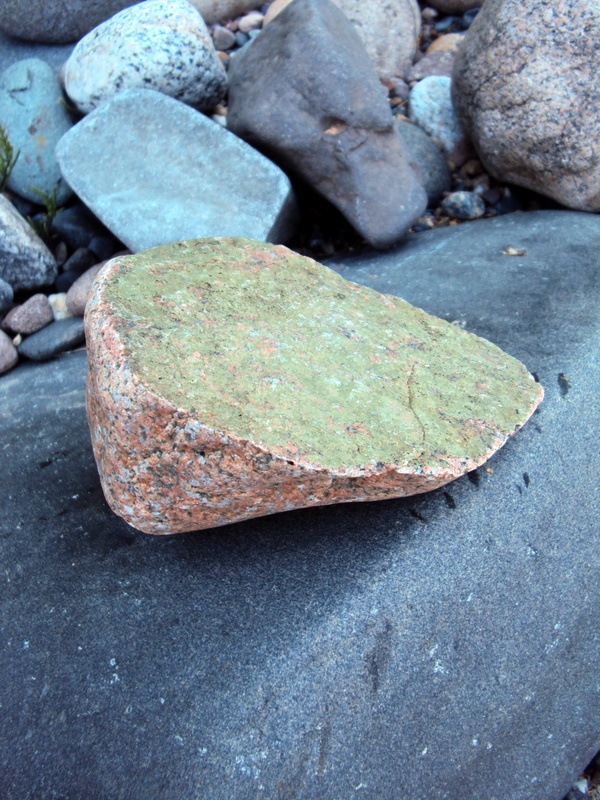 I am lucky to live along the shore of Lake Superior where some of the planet’s oldest rocks lie on the beaches. Stones of every shape, color and texture gleam up at the beach-walker through the icy water. The stones all are teachers. Each one shares a wave-tossed story. Each one whispers to your soul. You simply have to slow down enough to listen to the murmurings of rocks. If you’re talking in your mind, thinking of this and that, and what you have to do–you’ll never hear Stone Language. Only if you’re silent do you begin to hear the silent syllables of stones. Really silent. Walking on stones is an art. You all know that, right? If you don’t pay attention, you walk with jerky steps, trying not to fall. If you breathe deeply and watch your feet and center of balance the stones hold you. If not–be careful. Don’t fall in the lake. In between the stones rest treasures of plant and feather. Oh, yes, sometimes human garbage as well. Driftwood. Dead birds. Live toads. A galaxy of insects. Slow down! Don’t let your mind lead you along the beach, drawing you back to the Civilized World. Let the feet guide instead. They will stop often and admire the rocks. Some of us–rock hounds–will gather the silent cool hard creatures in bags to carry home and sit in our flower gardens or by our beds or in our peaceful living rooms. We know that stones enrich our home. We know that stones sing silent rock-songs while we dream at night. We know they keep us grounded and yet connected to our spiritual depths. Stones are the Keepers of Earth-secrets. They lie ready to teach. We must simply become more silent. Our heartbeats slow. When our hearts beat in rhythm with the stone, then we’ll be taught lessons of steady turning, moving, shaping with eons of ice and flow. Our spirit knows. I remember once, years ago, finding an eagle feather lying on the earth next to a beautiful white stone. Something inside whispered, “The stone can teach you more than the eagle feather.” I knew it true, but reached for the feather instead, wanting airy flight. These days it’s the deep stone of the earth which shares its teachings and I ken it well. We must be ready for the teachings of granite and quartz. Minerals grind us into earth’s diamonds as we heed their lessons. I remember playing with a young girl as a child along the shores of Lake Huron. I was told her parents were poor. She took me down along the beach and we sat on the rocks. She said the rocks were dishes. We pretended to eat on them. I was amazed–never before had I enjoyed playing so much! None of the plastic toy dishes of my childhood had ever seemed as marvelous as those rock plates. 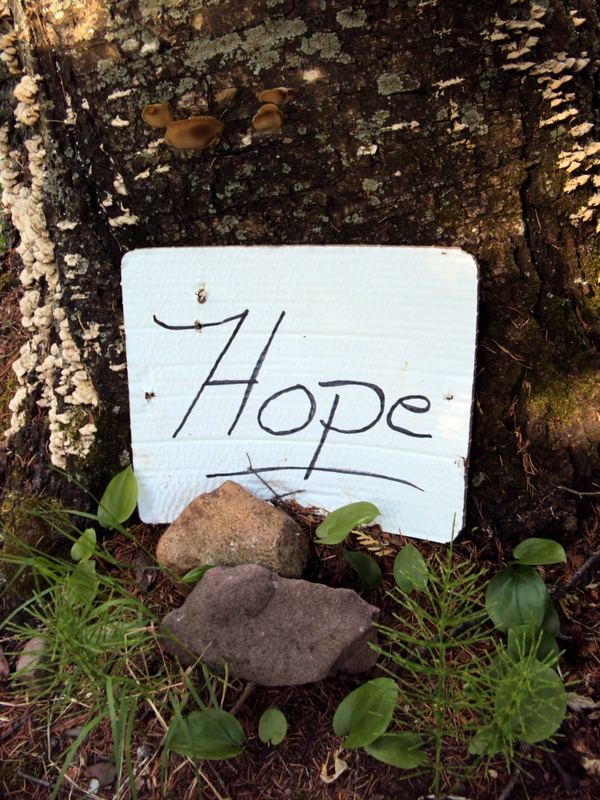 Stones whisper the message "Hope"
As I left the beach today, climbing under a fallen tree and up a steep hill, I glanced down. There was a hand-penned sign. “Hope”. Later on–another sign read “Faith”. They were propped up by stones. 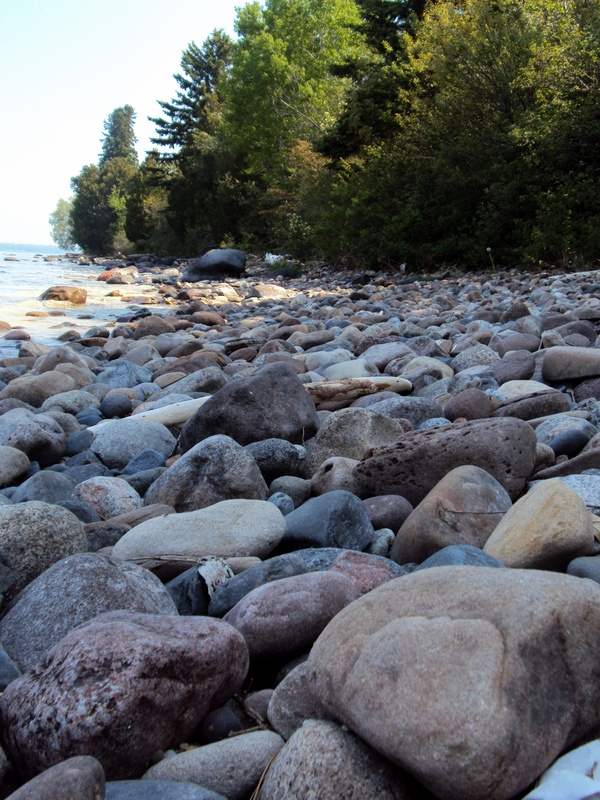 This entry was posted in Uncategorized and tagged beach, creativity, faith, friends, hope, Keweenaw Bay, Lake Superior, life, musings, nature, outdoors, personal, philosophy, photography, rocks, spirituality, stones, thoughts, Upper Peninsula. Bookmark the permalink. I love stones! The house where I grew up had stones all around it. My sisters and I used to take Barbie and friends to amazing waterfalls, lakes and rivers we created with the stones and a garden hose! Just like your stone dishes, our lakes were much better than the pink Barbie pool kept in a box inside our house. Your posts usually are a ticket to great memories! Thank you! You took me back to those Barbie years through your memories. How my friends and I loved to play Barbies in all sorts of settings! (Once I went to the Land of the Faeries with Barbie and her friends and was lost there for 3-4 hours. It was the first time in my life that I lost track of time. I’m still sure I spent those hours in the Faerie Kingdom.) I am glad you enjoyed your time with Barbie and friends in similar ways. Nature meets Toys!! Living near the Mississippi in St Paul Mineesota there werr lots of stones as well. You remind me of how my grandmothers basement was made with stones stacked up for the walls. I would always be amazed at them every time I went down there. Thanks for diverting my attention from caffeine to stones! Kim, your grandma’s basement walls sound lovely. I love stone walls…don’t see them too often. We do have a stone–slate–entry-way, though. Isn’t it fun to remember these things? Glad to provide the caffeination divertion! I’ve enjoyed your musing on rocks and stones – I especially like to think about “the silent syllables of stone” and the quiet it takes to listen. Lovely. Barb, the silent syllables of stone can teach us so much, can’t they? Thank you. Beautifully created blog. What a wondrous journey you took me on, Thank you so much. Not so much rocks or stone here in this area of New Jersey, I have rock I brought home from Easton Mt, Greenwich NY, that line the front steps, the where my balancing stones and sometime still are. I also have some in my room, do the speak to me at night they very well may! I have done some Shamanic Divination on rocks which is fun interesting experience. I love that photo of the rock with the leaves, Jeff! Beautiful… I love the idea that stones can balance us. That they can speak and divine. Glad you enjoyed this wondrous journey! Wish you could have been physically there, admiring the stones. Sandstone is so beautiful, Terrill. Thank you for accompanying me on this beach trip. Shall we try skipping stones on the water next time? Beautiful! You had me tearing up…and over rocks! 🙂 When I was living in my friend’s home on a bluff overlooking Lake Michigan I went for a daily walk and always came back with one (OK sometimes more than one) stone. Each was different and each precious to me. I couldn’t put any of them back so they sit here now, reminding me of a place I love. Dawn, some of my friends are absolute rock-hounds. If I went to the beach with Jan or Sue, they couldn’t leave without a pail full! Some of the rocks are so beautiful. Each is precious in its own way. And interesting how one rock can speak to us, but remains mute to another person. Love that you played on your blog with great rock photos! 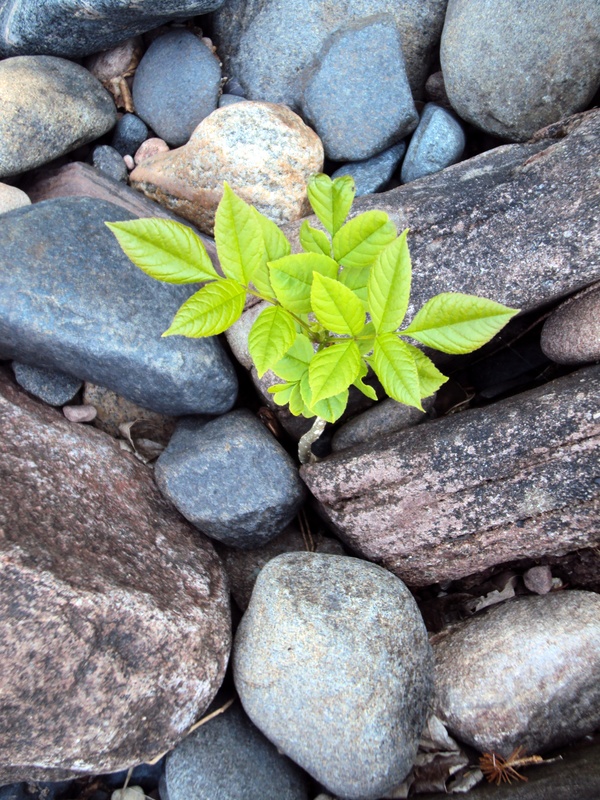 I invited myself to join the three of you; my Rock photos and comments are at http://www.mysiteontheweb.us/?p=1013. My blog, however, is not nearly as lovely and poetic as yours. I must now go visit Dawn’s and Suzi’s. Carol, I was so excited to see that you played along! I think your blog is lovely. How fun!! Kathy and all who are reading these comments today! Have you read: TEACHING A STONE TO TALK by Annie Dillard??? fountainpen, as I emailed you earlier today: yes, I am going to read that book! ASAP! I love Annie Dillard and her book sounds wonderful. Wondering now how she teaches a stone to talk… Hmmm…. never ever contemplated THAT before. My momma loves rocks and has graciously passed this love onto Kenzie! Thank you for taking us along on this stone journey. Beautiful words and photos! I also love this poem. Have you read it? Dear Emma: Yes, I like Panhala also…. 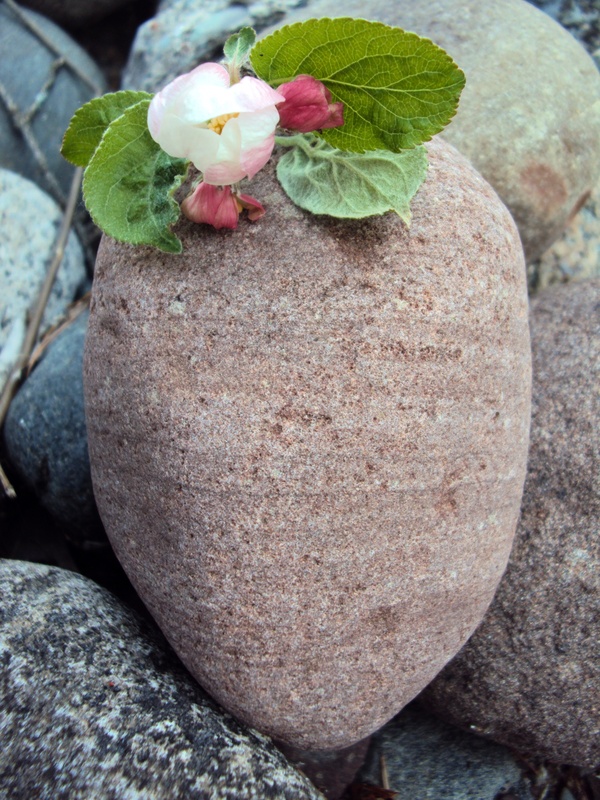 saying about listening to stone, collecting them…. Emma, thanks to you I get Panhala in my mailbox every morning! That stone poem is lovely indeed. I am glad you love stones too… peace stones, right? [arriving breathless] I’m a day late, but here nonetheless. i love stones, I Love Stones, I LOVE STONES. In case you didn’t get the idea — I love stones! I use them in my practice (along with crystals). For those of your readers who’d like to know the difference between crystals, stones, and minerals, here is a link to that page on our website (http://www.holessence.com/allaboutcrystals.html). Indeed, stones ARE the perfect props for Faith and Hope. Now I’m going to head over to Suzi’s post — thank you for the link. My goodness Laurie I could hear you running toward this blog! Slow down, breathe, even give yourself permission to miss a day or two if your busy. 🙂 I guess you LOVE stones!! Thank you for that link. That is very instructive. And by the way–Suzi has posted now. I am headed over that way too. Ah…. rocks and stones, stones and rocks! You have captured my thoughts on rocks perfectly! And your photos are gorgemous! Oh good, Cindy, glad to have mirrored your own thoughts. As you are the Rock Lady Extraordinaire!! Thank you for liking the little & big beach beauties. As for moss–yes, that too! 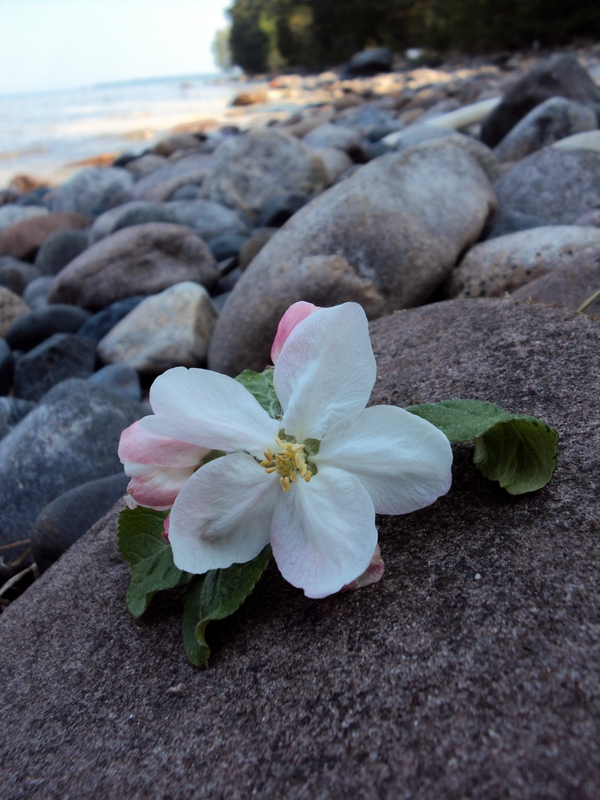 “Tentative apple blossom on rock” – so exquisitely lovely! I’m one of those people who collects rocks to adorn my home and garden. So true, “the inside is not always the same as the outside…” Don’t forget stone walls, I love stone walls! PS Dare I ask about next week? OK, Suzi, headed over there! I snuck over there briefly in between things but need to head back over there and simply be present with your words and photos. WordPress coaching: Any time!! Thank YOU for this week’s inspiration. I am a little hesitant to commit to next week yet because…well, I am not sure what is happening next week. Possible plans. We shall see! Oh how I wish I was there!!! I think it’s time to lay on the rocks and reconnect with that energy that is so still and so sweet. *sigh* Soon I hope! I think my purpose in life is to be the legs for all of the Yooper stones with wanderlust. I’ve migrated carloads from the quarries of Marquette to the banks of the Mississippi, and pails full travel from Copper Harbour too. Of course I thought about you, Sue! And Jan! Two of the most avid rock-hounds I know. It sounds like that is your purpose in life. (I’ve seen your car filled with pails…) Must be time for another journey to our beloved U.P. Her treatment is simple, sweet, humorous, poetic. which leads to opening up to their creativity. And three, I love how it brings me back to a place of innocence of heart and mind, reminds me there is sweetness in the world, and all in the simplicity of something that lies on the ground and you pass thousands of them every day. Leave it to people like Byrd and Kathy to lead one to simply look, closely again. Julie, I have never heard of that book. Will have to look up that one, too. Don’t you love books? Looking a rock in the eye… what a beautiful way to put it. And to think of children innocently playing with rocks. Thank you! Thank you very much for this stone offering.